One often hears that Hong Kong is the “New York of the Orient.” Perhaps that implies that Kowloon is the “New Jersey of the Orient.” Situated across the bay from Hong Kong, similar to the New Jersey/NYC geography or Oakland’s adjacency to the much-revered San Francisco, anyone who has travelled to Kowloon is stunned by the vista of the Hong Kong skyline whether standing onshore or riding the across the harbor. Kowloon’s reputation at times mirrors that of the ugly stepsister. Yet, much like New Jersey’s proximity to New York, Kowloon is positioned to play an important role in the growth of China, though often without the same level of international recognition received by Hong Kong. Kowloon’s importance is unequivocal, but it doesn’t necessarily seek the high-profile of Hong Kong. Growing up in a city which was in the shadow of its neighbor may have had some effect upon Thomas Leung’s point of view. 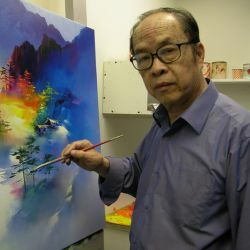 Born in 1958, Thomas was part of the rapidly increasing population of Hong Kong, which reached 4.4 million, according to encyclopedia.com in 1975, just a few years before his family moved to the United States. The infrastructure of Kowloon initially could not keep up with the population growth. As mentioned in the Kwong Wah Hospital website, in the 1950’s, one might see “2 or 3 patients sharing one bed while camp beds were put up in the corridors” which prompted the authorities to begin plans for expansion. Kowloon and Hong Kong are also known for their demographic diversity, being intricate players in the commerce and economic boom of China, which has drawn immigrants from around the world who wish to be a part of the growth. Thomas grew up until the age of 20 surrounded by this environment of rapid growth and global integration coupled with under-resourced government and municipal services. He witnessed and participated in the resilience and resourcefulness of China in an age of scarcity wrought by growth and expansion. Without a doubt, this environment has impacted his artistic style. When Thomas moved away from this land marked by a surplus of people and a shortage of resources, however, he didn’t leave China behind, forsaking his heritage. As one can see from the beautiful work created by Leung, he certainly loves the tropics and undoubtedly he explored many of the 234 islands abutting Kowloon before his family moved to the USA. His method reflects an echo of the lessons his father taught him but it takes a completely different pathway and thus achieves an exceptional result. At times, his work is more abstract, at others bold and full of contrasts and in still others, harmonious. Though his father was self-taught, he was instrumental in Thomas’ development in two primary roles: first as a mentor by offering initial instruction and encouragement, and then as a sponsor by providing access to formal education and that all-important ingredient, faith. Being compared with his father is an honor for Thomas. It can be complicated to establish your own reputation when you have a famous father, but Thomas has definitely achieved a one-of-a-kind stature. Much like Jamie Wyeth, another artist who is a son of a famous artist, Andrew Wyeth, noted in a 1975 interview for the Ottawa Citizen, “being the son of …has its pluses and minuses”. Perhaps the same was true for 15th century artist Fra Filippo Lippi and his son Filippino Lippi, an artist in his own right. Certainly the tradition of handing down both genetically and interactively the artistic insight from one generation to the next is timeless. Each of the younger members of these artistic father/son duos, Leung, Wyeth and Lippi, initially learned the craft first at the hip of his respective father. In the case of Thomas, by immigrating to the United States in 1975, his father was able to provide him access to a formal collegiate education, something which the elder Leung never received. Upon graduation, Thomas Leung began exhibiting his work, revealing his individuality and sharing a perspective that reflects his world view. Thomas Leung’s work stands alone—similar and yet distinct from that of his father. The two proudly share their heritage and history, yet like the two neighboring cities, though mutually cooperative and interdependent, whether they be Hong Kong and Kowloon, New Jersey and New York City or Oakland and San Francisco, they each offer different vistas to the viewer and distinctive opportunities to the collector. FineArt360 is enchanted to represent the work of Thomas Leung.